Note: If you are a member of an organization that is using Buck, please consult with your colleagues to see if your organization has site-specific documentation for Buck. Buck is flexible and configurable, and many organizations have created their own Buck documentation, which is specific to their use cases—in addition to the documentation here. Development for iOS is supported only on macOS. This is a quick-start guide for getting up and running with Buck. This article is light on details, instead focusing on the commands that you need to run to install Buck and build your first application from scratch using Buck. While not a prerequisite for installing Buck itself, in order to build iOS applications, you will also need to install Xcode. The commands in this guide are designed to be copy-pasteable, idempotent, and usable on its representative operating system (macOS, Linux, Windows). Sometimes this results in some unusual constructions (such as using echo instead of vi or Emacs to create a file). Bear in mind that this is a quick start guide, and few things are quicker than copy-and-paste! Currently, there is no way to download a precompiled binary for Buck. In order to use Buck on Windows 10, you need to ensure that your installation of Windows meets the following requirements. at Microsoft's Windows Developer Center. You should have a policy called Create symbolic links. Enable it for any users who will be running Buck on the local computer. You could enable the accounts of those users specifically or if all those users belong to a Windows security group, you could enable that security group. Restart your computer for this change to take effect. While not a prerequisite for installing Buck itself, to build Android applications, you will also need at least the Android SDK and the Android NDK, which can be installed via Chocolatey or manually downloaded and installed. While not a prerequisite for installing Buck itself, to build Android applications, you will also need at least the Android SDK and the Android NDK, which can be installed via Homebrew or manually downloaded and installed. While not a prerequisite for installing Buck itself, to build Android applications, you will also need at least the Android SDK and the Android NDK, which can be installed via apt-get (or your distro's package manager) or manually downloaded and installed. Buck currently requires Java 8; we are working toward support for future versions. If you have multiple installations of Java on your development computer, you might get warnings from Buck that you are using an unsupported version of Java. To resolve this issue, set the JAVA_HOME environment variable to the directory for version 8 of the Java Development Kit (JDK). Note that the directory that JAVA_HOME points to should contain a bin subdirectory which in turn contains binaries for the Java compiler (javac) and Java runtime (java). Buck currently requires Java 8; we are working toward support for future versions. If you have multiple installations of Java on your development computer, you might get warnings from Buck that you are using an unsupported version of Java. To resolve this issue, set the JAVA_HOME environment variable to the directory for version 8 of the Java Development Kit (JDK). Note that the directory that JAVA_HOME points to should contain a bin subdirectory which in turn contains binaries for the Java compiler (javac.exe) and Java runtime (java.exe). This automatically adds buck to Chocolatey's path, and lets you run commands just by typing buck on the command line. Buck is available as a bottle on Homebrew. If you have multiple installations of Java on your development computer, you might get warnings from Buck that you are using an unsupported version of Java. To resolve this issue, set the JAVA_HOME environment variable to the directory for version 8 of the Java Development Kit (JDK). Note that the directory that JAVA_HOME points to should contain a bin subdirectory which in turn contains binaries for the Java compiler (javac) and Java runtime (java). to reset the command-line tools path to where the command line tools are installed. We strongly recommended that you install Watchman. 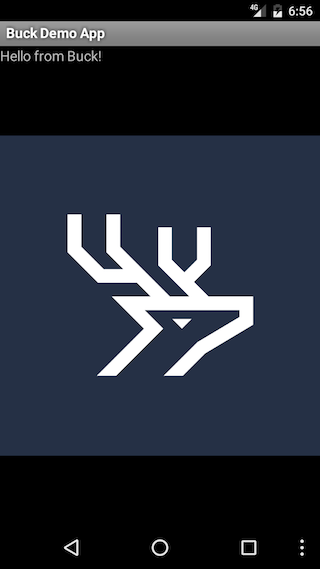 With watchman, Buck uses a daemon (buckd) which prevents Buck from needing to parse all of your build files every time you build—and it caches some other components of your build as well. You can use Homebrew to install many of the prerequisites on a Mac. --help         : Shows this screen and exits. --version (-V) : Show version number. Because you will likely be running ./bin/buck often, you should add it to your path so that you can simply run buck from the command line. With watchman, Buck will use a daemon which will prevent Buck from parsing all of your build files every time and cache some other things as well. It is strongly recommended that you install Watchman. You can use Chocolatey to install many of the prerequisites on Windows. For some distros, the default packages may be older than what you would like. In those cases, either build those packages from source, or find third party repositories beyond the default that is used by apt-get via sudo add-apt-repository (or however you add new repositories on your distro). You will need to tell Buck where to find the Android SDK and NDK. The value of the [android].sdk_path property in .buckconfig. The value of the [ndk].ndk_path property in .buckconfig. The [ndk].ndk_repository_path property in .buckconfig. If you specify both the environment variable and the .buckconfig setting, the environment variable takes precedence. If you specify an NDK repository, Buck selects the NDK based on the version that you specify in the [ndk].ndk_version property of .buckconfig. Because you will likely be running .\bin\buck often, you should add it to your path so that you can simply run buck from the command line. Now that Buck is installed, it is time to use Buck in a sample project. ios/main.m: The main iOS file supported by other views, controllers and associated resources. ios/BUCK: The build file is what makes Buck work. It defines all the build rules for your source code. A build rule may also include dependencies (via deps), which may be from other build files. .buckconfig: A .buckconfig file allows for various flag and alias settings for any project (even beyond iOS) within the root directory. In order to build the app, you use the buck build command, specifying your app as the target. The target may be defined in the [alias] section in the .buckconfig file or it would be the name of your iOS project prepended by //[the directory where your project is located]: (e.g., //ios:BuckDempApp). # demo_app_ios is an alias in .buckconfig for //ios::BuckDemoApp. Either works. The first time you build, you will most likely see a longer time and cache misses. Subsequent builds should be much faster, with minimal cache misses. Buck outputs its results in the buck-out/ directory. Now that you know your app has built successfully, you can install and run the app with buck install. This command both compiles and installs the application on the iOS simulator. Using the --run flag will launch the simulator as well. android/java/com/facebook/buck/demo/Hello.java: The main Java file supported by other associated resources. android/BUCK: The build file is what makes Buck work. It defines all the build rules for your source code. A build rule can also include dependencies (generally via deps), which may be from other build files, as in the case of this app. .buckconfig: A .buckconfig file allows for various flag and alias settings for any project (even beyond Android) within the root directory. Before building an app you need to configure environment variables to let Buck know the locations of Android SDK and Android NDK. Set the missing variables to the locations of Android SDK and Android NDK or set the paths in your .buckconfig file. See [android].build_tools_version to get the version of build tools in Android SDK. [android].target points to the target. [ndk].ndk_version points to the version of Android NDK. [android].sdk_path is an absolute path to the Android SDK. [ndk].ndk_path is an absolute path to the Android NDK. [ndk].ndk_repository_path is an absolute path to a directory that contains multiple Android NDKs in subdirectories. Buck selects which NDK to use based on the value of the [ndk].ndk_version property in .buckconfig. In order to build the app, you use the buck buildcommand, specifying your app as the target. The target may be defined in the [alias] section in the .buckconfig file or it would be the name of your Android project prepended by //[the directory where your project is located]: (e.g., //android:demo-app). # demo_app_android is an alias in .buckconfig for //android:demo-app. Either works. Now that you know your app has built successfully, you can install and run the app with buck install. This command both compiles and installs the application on the Android emulator. Using the --run flag will launch the emulator as well. Installing apk on emulator-5554 (android-emulator). If you get an error either that you do not have certain Android add-ons (e.g., Google APIs) or that there is no emulator to run, you should launch the Android SDK Manager (e.g., android sdk) and install the appropriate packages and/or run your emulator (usually found under Tools | Manage AVDs). Now that Buck is installed, it is time to use Buck in a sample project. 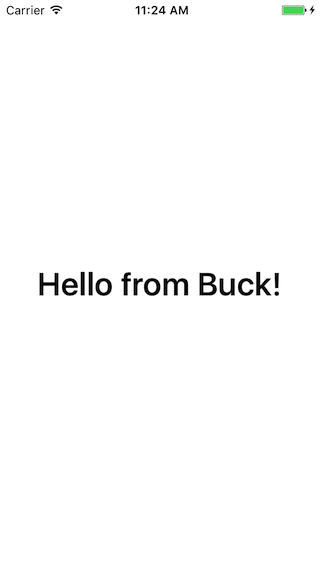 In particular, we are going to build a simple Java "Hello Buck" library and application. com/facebook/buck/demo/HelloBuckJava.java: The main Java application file. com/facebook/buck/demo/HelloStringJava.java: A simple Java library with one function that the main app calls. com/facebook/buck/demo/BUCK: This build file is what makes Buck work and is the trigger for building the application. It defines all the build rules for your source code. The key rules you will see in this file is java_binary and java_library. A build rule may also include dependencies (generally via deps), which may be from other build files. .buckconfig: A .buckconfig file allows for various flag and alias settings for any project (even beyond this Java application, if they existed) within the hello-buck-java directory. In order to build the library, you use the buck build command, specifying your app as the target. The target may be defined in the [alias] section in the .buckconfig file or it would be the name of your Java application prepended by //[the directory where your project is located]: (e.g., //com/facebook/buck/demo:hello-buck-java). # hello_buck_java is an alias in .buckconfig for //com/facebook/buck/demo:hello-buck-java. Either works. Now that you know your app has built successfully, you can install and run the app with buck run. This command both compiles and runs the application.